Diplomatic differences between Turkey and Russia over Syrian border security and other concerns could undermine talks on Syria in the Russian Black Sea resort of Sochi on Thursday, Voice of America said on Tuesday. 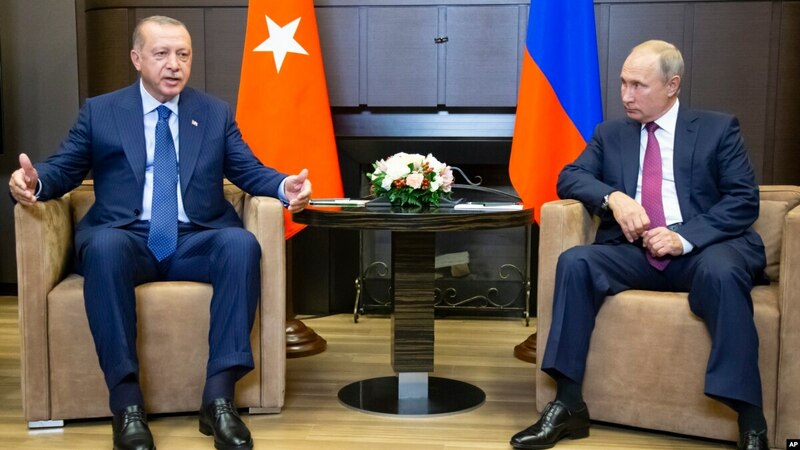 The two countries are at odds as Moscow is demanding more decisive action from Ankara over the northeastern province of Idlib, while Ankara seems more occupied with plans to establish a safe zone in northern Syria, VOA said. Turkey and Russia made a deal in September over Idlib, the last major rebel-held enclave in Syria, which effectively postponed a military assault by the Syrian government. Ankara was to remove the radical rebels in a demilitarised zone to be established in the province, but instead the jihadist groups ousted moderate rebels backed by Turkey in December. Turkish and Russian defence ministers met on Monday to discuss measures to stabilise the situation in Idlib ahead of summit between the two countries and Iran, and after Russian Foreign Ministry spokeswoman Maria Zakharova last week urged Turkey to uphold its promises. But a joint statement by the two ministers following their talks indicated no breakthrough, VOA said. Aktar said Turkish President Recep Tayyip Erdoğan’s priority at the moment was to postpone any offensive against Idlib ahead of local elections in Turkey on March 31. “They are playing for time, and sooner or later this pocket will be emptied,” said Aktar. Analysts say Russian President Vladimir Putin may avoid risking its deepening relations with Ankara, which is also in talks with Washington to establish a safe zone in northern Syria to clear the area of Kurdish fighters. Turkish Defence Minister Hulusi Akar is scheduled to meet acting U.S. Defense Secretary Pat Shanahan on the sidelines of a NATO meeting in Brussels on Wednesday, one day before the trilateral summit in Sochi. Turkey is facing a dilemma as both Washington and Moscow have been supporting the Kurds, according to international relations professor Hüseyin Bağcı of Ankara’s Middle East Technical University. “The Americans are against a Turkish intervention in Syria and Putin in not supporting Turkey on this.” Bağcı said. “It's give and take for Putin,” said Aydın Selcen, a former Turkish diplomat who served in the region. If Ankara does its homework and takes steps to remove radical groups in Idlib, there will be a yellow light for a limited Turkish operation against Syrian Kurdish forces in northern Syria, Selcen said.